Yesterday, the Euro edged higher against the US Dollar following a lower-than-expected US Consumer Price Index (CPI). 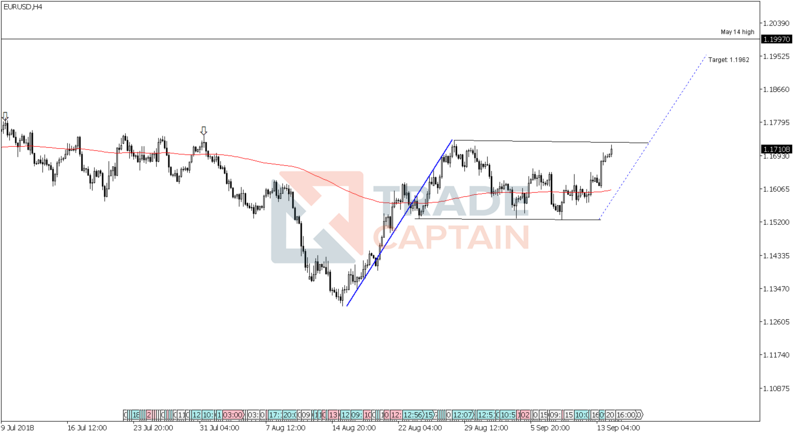 However, the EUR/USD pair remains capped in a consolidation array between the 1.1733 and 1.1530 levels and forming a possible bull flag pattern, pattern that suggests a bullish continuation. The bull flag pattern has three components; the flagpole, the flag, and the potential uptrend, which is measured the same as the flagpole. The recent bullish leg run from the August 15 low of 1.1312 to the August 28 high of 1.1733 might be considered as the flagpole (solid blue line). The consolidation from August 28 to present suggests a flag pattern, and the dotted blue trend line derived from the flagpole height is the potential uptrend target at 1.1962, which is close to the May 14 high of 1.1997. I suspect that traders might see this as an opportunity to long EUR/USD. On the other hand, breaking the lower limit of the flag might invalidate the bull flag formation.